Historically Email sending has been very different from what most people use it in the Office, there was no heavy Email clients such as Outlook Express no MX Exchange, no e-mail client capabilities for Calendar and Meetings schedule as it is in most of the modern corporate offices that depend on products such as Office 365 (I would call it a connectedHell 365 days a year !). There was no free webmail and pop3 / imap providers such as Mail.Yahoo.com, Gmail.com, Hotmail.com, Yandex.com, RediffMail, Mail.com the innumerous lists goes and on. Nope back in the day emails were doing what they were originally supposed to like the post services in real life simply send and receive messages. For those who remember that charming times, people used to be using BBS-es (which were basicly a shared set-up home system as a server) or some of the few University Internal Email student accounts or by crazy sysadmins who received their notification and warnings logs about daemon (services) messages via local DMZ-ed network email servers and it was common to read the email directly with mail (mailx) text command or custom written scripts … It was not uncommon also that mailx was used heavily to send notification messages on triggered events from logs. Oh life was simple and clear back then, and even though today the email could be used in a similar fashion by hard-core old school sysadmins and Dev Ops / simple shell scriptings tasks or report cron jobs such usage is already in the deep history. The number of ways one could send email in text format directly from the GNU / Linux / *BSD server to another remote mail MTA node (assuming it had properly configured Relay server be it Exim or Postifix) were plenty. In this article I will try to rewind back some of the UNIX history by pinpointing a few of the most common ways, one used to send quick emails directly from a remote server connection terminal or lets say a cheap VPS few cents server, through something like (SSH or Telnet) etc. 1. Using the mail command client (part of bsd-mailx on Debian). I ended the article with a short explanation on how this is done but I will repeat myself one more time here for the sake of clearness of this article. The mail command will connect to local server TCP PORT 25 on local configured MTA and send via it. If the local MTA is misconfigured or it doesn't have a proper MX / PTR DNS records etc. or not configure as a relay SMTP remote mail will not get delivered. Sent Email should be properly delivered at remote recipient address. How to send HTML formatted emails using mailx command on Linux console / terminal shell using remote server through SSH ? email_content.html should be properly formatted (at best w3c standard compliant) HTML. Whatever text mixed with valid email HTML tags here. Above command sends to two email addresses however if you have a text formatted list of recipients you can easily use that file with a bash shell script for loop and send to multiple addresses red from lets say email_addresses_list.txt . To further advance the one liner you can also want to provide an email attachment, lets say the file email_archive.rar by using the -A email_archive.rar argument. For those familiar with Dan Bernstein's Qmail MTA (which even though a bit obsolete is still a Security and Stability Beast across email servers) – mailx command had to be substituted with a custom qmail one in order to be capable to send via qmail MTA daemon. Do you remember that heavy hard to configure MTA monster sendmail ? It was and until this very day is the default Mail Transport Agent for Slackware Linux. -v argument provided, will make the communication between the mail server and your mail transfer agent visible. ssmtp MTA and its included shell command was used historically as it was pretty straight forward you just launch it on the command line type on one line all your email and subject and ship it (by pressing the CTRL + D key combination). 0 upgraded, 2 newly installed, 3 to remove and 1 not upgraded. Need to get 239 kB of archives. After this operation, 3,697 kB disk space will be freed. Package exim4-daemon-heavy which provides mail-transport-agent is to be removed. Selecting previously unselected package libgnutls-openssl27:amd64. Mutt supports reading / sending mail from multiple mailboxes and capable of reading IMAP and POP3 mail fetch protocols and was a serious step forward over mailx. Its syntax pretty much resembles mailx cmds. telnet is and will always be a great tool for doing SMTP issues troubleshooting. It is very useful to test whether a remote SMTP TCP port 25 is opened or a local / remote server firewall prevents connections to MTA. Note that the returned messages are native to qmail, a postfix would return a slightly different content, here is another test example to remote SMTP running sendmail or postfix. It is handy if you want to know whether remote MTA server has a certain Emailbox existing or not with telnet by simply trying to send to a certian email and checking the Email server returned output (note that the message returned depends on the remote MTA version and many qmails are configured to not give information on the initial SMTP handshake but returns instead a MAILER DAEMON failure error sent back to your sender address. Some MX servrers are still vulnerable to this attack yet, historically dreamhost.com. Below attack screenshot is made at the times before dreamhost.com fixed the brute force email issue. Other tool besides telnet of testing remote / local SMTP is netcat tool (for reading and writting data across TCP and UDP connections). The way to do it is analogous but since netcat is not present on most Linux OSes by default you need to install it through the package manager first be it apt or yum etc. First lets create a new file test_email_content.txt using bash's echo cmd. Because of its simplicity and the fact it has a bit more capabilities in reading / writing data over network it was no surprise it was among the favorite tools not only of crackers and penetration testers but also a precious debug tool for the avarage sysadmin. netcat's advantage over telnet is you can push-pull over the remote SMTP port (25) a non-interactive input. Using curl webpage downloading advanced tool for managing email send might be a shocking news to many as it is idea is to just transfer data from a server. curl is mostly used in conjunction with PHP website scripts for the reason it has a Native PHP implementation and many PHP based websites widely use it for download / upload of user data. To learn more about curl capabilities make sure you check cURL –manual arg. Curl is capable to send emails from terminal using Gmail and Yahoo Mail services, if you want to give that a try. 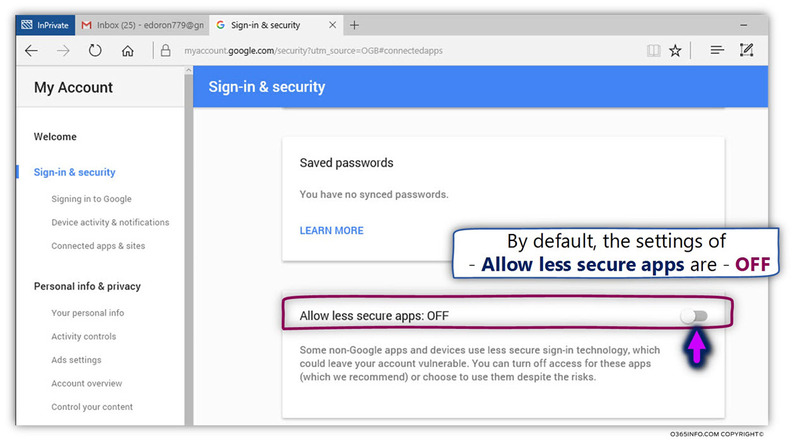 Go to myaccount.google.com URL and login from the web interface choose Sign in And Security choose Allow less Secure Apps to be -> ON and turn on access for less secure apps in Gmail. Though I have not tested it myself so far with Yahoo! Mail, I suppose it should have a similar security settings somewhere. Here is how to use curl to send email via Gmail. To use Mailgun to script sending automated emails go to Mailgun.com and create account and generate new API key. The -F option that is heavy present in above command lets curl (Emulate a form filled in button in which user has pressed the submit button). For more info of the options check out man curl. If you are spending too much time iterating "telnet foo.example 25"
If you want to hide the password not to provide the password from command line so (in order not to log it to user history) add the -a options. qmail-inject is part of ordinary qmail installation so it is very simple it even doesn't return error codes it just ships what ever given as content to remote MTA. If the linux host where you invoke it has a properly configured qmail installation the email will get immediately delivered. The advantage of qmail-inject over the other ones is it is really lightweight and will deliver the simple message more quickly than the the prior heavy tools but again it is more a Mail Delivery Agent (MDA) for quick debugging, if MTA is not working, than for daily email writting. It is very useful to simply test whether email send works properly without sending any email content by (I used qmail-inject to test local email delivery works like so). 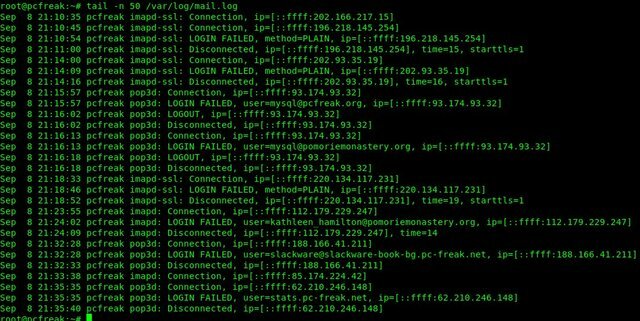 If you use some of the above described methods and email is not delivered to remote recipient email addresses check /var/log/mail.log (for a general email log and postfix MTAs – the log is present on many of the Linux distributions) and /var/log/messages or /var/log/qmal (on Qmail installations) /var/log/exim4 (on servers running Exim as MTA). The ways to send email via Linux terminal are properly innumerous as there are plenty of scripted tools in various programming languages, I am sure in this article, also missing a lot of pre-bundled installable distro packages. If you know other interesting ways / tools to send via terminal I would like to hear it. Hope you enjoyed, happy mailing ! This entry was posted on Monday, September 10th, 2018 at 5:00 pm	and is filed under Curious Facts, Email clients, Linux, System Administration. You can follow any responses to this entry through the RSS 2.0 feed. You can leave a response, or trackback from your own site.